I do most of my writing in the pre-dawn hours of the morning and this blog was no exception. However as I ensconced myself in my comfy chair and prepared to put finger to keyboard, my morning reverie was interrupted by a cacophony of squawking and bleating from the yard. It woke my wife who charged past me through the door still in her night clothes, followed closely behind by my shepherd cross who plunged into the darkness howling like the urban predator that he aspires to one day be. A flashlight beam revealed the source of the commotion. In my small inner-city urban lot an opossum had forced its way into my chicken and goat shed looking for a meal. He probably would have settled for an egg but the chickens and goats were not taking any chances and they would wake the rising sun, not to mention the entire neighborhood, to plead their case. I carefully prodded him out of the shed with a shovel. He didn't play dead. He growled and he hissed and as he waddled off into the darkness, he gave me one last look back as if to say "to hell with you and your urban poultry." What Does It Mean to "Live with Urban Wildlife?" It is a phrase that gets thrown around a lot these days and is one that we explore in Wild in the City: Exploring The Intertwine. As a conservationist it is easy to focus in on the imperative to preserve imperiled species--but it is also a topic with profound spiritual, economic, intellectual, and environmental justice dimensions. Like many cities, Portland was built along a river--in fact at the confluence of two great rivers, the Willamette and the Columbia. The Willamette drains 11,500 square miles and flows almost due north for 187 miles until it runs into the mighty Columbia, turns left and heads to the sea. In terms of average discharge, the Columbia is the 4th and the Willamette is the 19th largest of rivers in the United States. Their confluence area was once a sprawling floodplain covered in wet prairies and hardwood bottomland forest. From a conservation perspective there are few places in Oregon that would be less desirable to convert into an urban hardscape. Wildlife still abounds here---the fish and birds travel the migratory routes they have travelled since time immemorial. The question is not whether they will come, but what they will find when they arrive here. When peregrine falcons first began nesting on Portland's Fremont Bridge in 1994, the species was still on the front end of its recovery in Oregon. Despite having been listed under the Endangered Species Act since 1973, more than two decades later, there were only 26 pairs of peregrines known to be nesting anywhere in Oregon. When they first arrived there was talk of actually removing their eggs or young from the urban nest site and fostering them into a more remote "safer" nest site on Mt. Hood. At the time, Oregon had just emerged from the spotted owl wars pitting rural timber communities against endangered species recovery programs. Portland Audubon and others felt it was important not only that the community have a chance to experience these magnificent birds but also that urbanites be willing to accommodate an endangered species in their own midst. 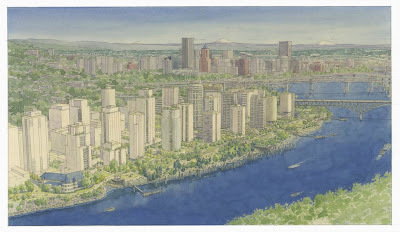 Initially, the Fremont site was expected to be a sacrifice site---good for education but not so much for productivity. An extensive education, research, monitoring and management program dubbed " Peregrine Watch" was launched engaging natural resource agencies, Audubon, Oregon Department of Transportation and more than 100 volunteers. "helping humans and wildlife live together." 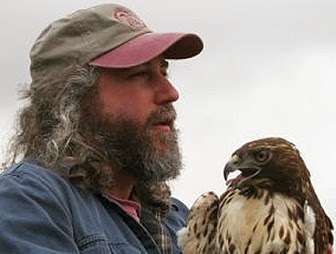 Strategy for Migratory Bird Management and Conservation---a program that one manager noted began with the effort to protect falcons. 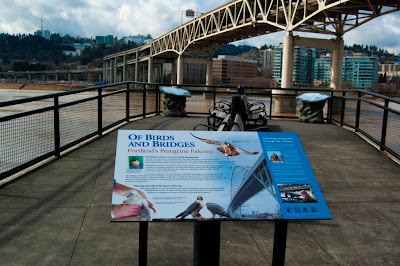 Peregrine Falcon interpretive sign under Portland's Marquam Bridge. Past will need to be prologue. In 1998, Willamette River salmon and steelhead were also listed under the Endangered Species Act. Every fish that uses the 11,500 square mile Willamette River Basin needs to pass through downtown Portland, including 11 miles that have been listed as a Federal Superfund Site. Recovering listed salmon on the Willamette River has required a massive rethinking about how we protect and develop our urban waterway. How do we take our river confluence, an area that once provided a wide swath of braided channels so shallow that you could walk from one site to the other in places, but which today has been channelized, deepened, hardened, and polluted, and turn it back into something ecologically functional? 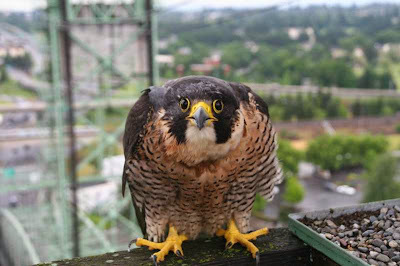 Peregrines were easy compared to the ecological and economic challenges of recovering our river, but programs such as the City of Portland Endangered Species Program and Watershed Health Management Plan are setting a course toward river health. Birds are not faring so well either. 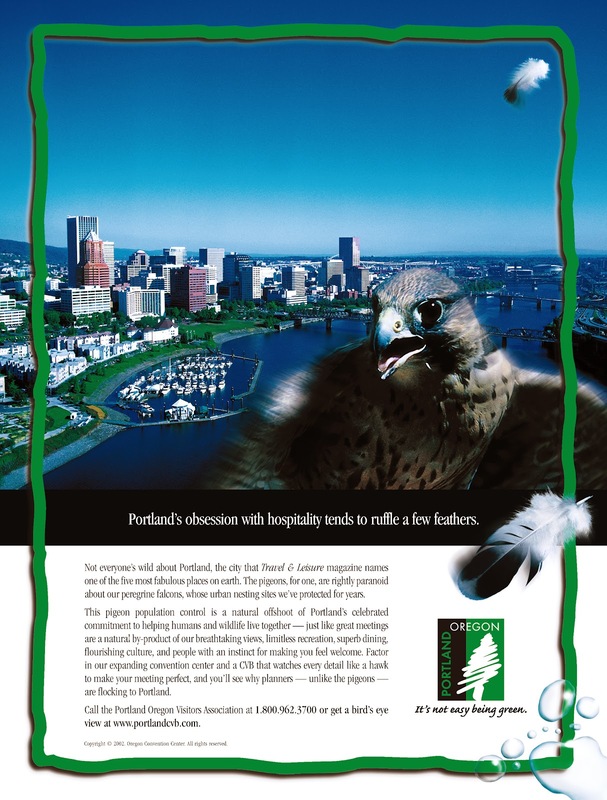 More than 200 species of birds pass through the Portland Metropolitan Area annually. According to the Audubon Common Birds in Decline Report, approximately one out of four of these species is experiencing serious long-term declines. While the causes of decline often lie beyond our urban landscapes, there is much that we can do in our cities to increase permeability and reduce hazards on our urban landscapes ranging from protecting interconnected systems of natural areas to housing cats indoors to building birdsafe buildings and reducing nighttime lighting to reduce risk of collisions. In Portland, we are beginning to experiment with the potential for ecoroofs to provide biodiversity as well as sustainable stormwater and energy benefits. 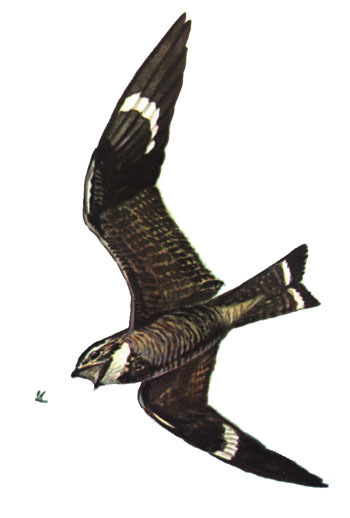 ﻿﻿One hope is that we can bring back nighthawks, a species that was once fairly common over Portland but which declined concurrent with the disappearance of gravel rooftops. The City's Grey to Green Program seeks to add 43-acres of ecoroofs over the next several years. What is the extinction of the condor to a child who has never known a wren? I can't put it any better than Robert Michael Pyle did in his book The Thunder Tree: Lessons from an Urban Wildland. For a population that is increasingly living on urban landscapes, conservation is going to begin in backyards, undeveloped lots and neighborhood greenspaces. If we want to raise the next generation of conservationists we need to inspire and engage them, not with panda bears and polar bears on television but rather with nature nearby. Even in a "green" city like Portland, far too many residents do not have access to nature. A recent publication by the Coalition for a Livable Future showed that in Portland nearly half the residents of Portland do not have access to a park within walking distance of their homes. Too many people have bought into the concept that cities are places for people and not for wildlife to the point where they no longer even see, let alone understand, the wildlife that does still surround them. 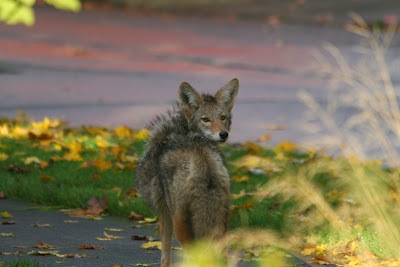 On a very rare sunny warm Sunday morning in October a coyote strolled casually through a Portland neighborhood. The sun had brought the community out into the streets, jogging, strolling, greeting their neighbors like long lost friends. The coyote, which we would learn later had been habituated to human food handouts ranging from whole plucked chickens to leftovers from a Greek restaurant, strolled among them. For more than an hour he travelled a seemingly well-worn path. At one point I lost sight of him and stopped to ask a man tending to his yard whether he had seen a coyote pass by. 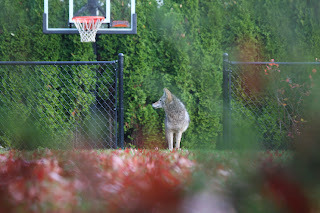 "No," he told me, "but check down by the road on the basketball court. He is often there about this time of day." 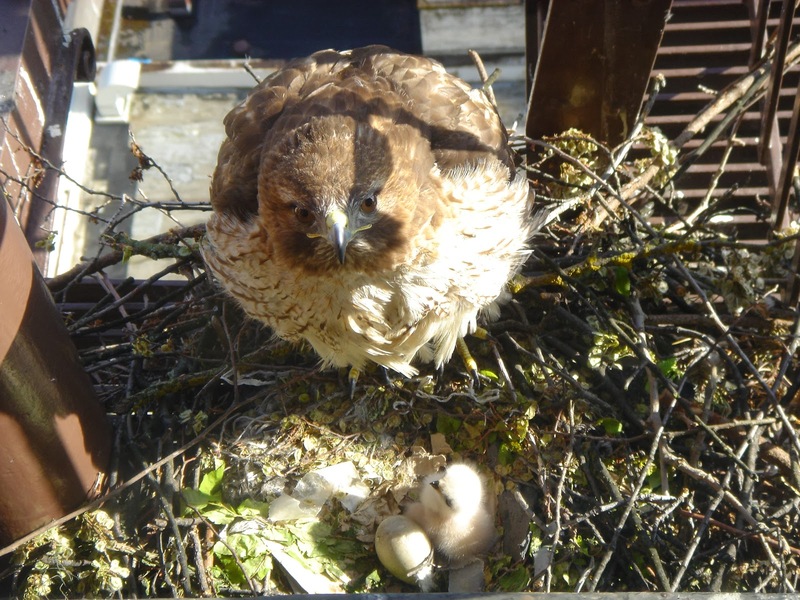 In 2007 Audubon and a local television station, KGW put a cheap webcam in the window of an office looking out on a pair of red-tailed hawks that had nested on the adjacent fire escape. 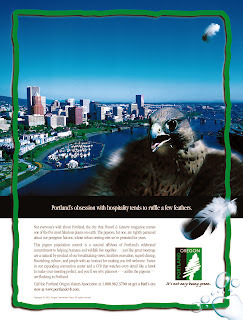 Today bird cams have proliferated but in 2007 the KGW-Audubon Raptor Cam was relatively new thing. It was a quick and dirty set-up--since the birds had already begun nesting, a proper installation was not feasible. The shot was compromised by a fuzzy focus and a windowsill that bisected the shot. Occasionally office workers would knock the camera over and viewers would be treated to a sideways view of the nest. KGW-Audubon Raptor Cam Red-tail cares for recently hatched chick. The first year web hits approached 40,000. By year two we had a better camera and more than half a million hits. People follow the hawks like a favorite soap opera-- inspired by the hawks raising their young amid our concrete canyons. An online community has formed around the birds, classrooms use it to support lesson plans, and when the hawks shifted to a new site this year away from our prying lens, there was a general outpouring of grief. It leaves me wondering, in the end does it inspire people to go outside and look up? To naturescape their yards? To support the next bond measure? That, ultimately, is the real message behind Wild in the City: A Guide to the Intertwine---go outside, look up, down, and all around. Connect! We share our own yards, our neighborhoods, our greenspaces with a vast array of fellow travelers....there is much that we can do to be stewards of that trust. About the time Bob's blog was being posted I was out for a seven-mile jaunt along Leif Erickson Road which bounds the eastern edge of 5,000-acre Forest Park, Portland's largest natural area park. While I thoroughly enjoyed my first black-throated gray and Wilson's warbler songs of the spring, it was the spectacular kettling--if that term applies in this instance----of six....count 'em......six bald eagles directly overhead that I could see through a window in the dense forest canopy. Screaming........screeching seems more apropos to their high, squeaky call.....to one another, they spiraled higher toward billowy white clouds. All a fifteen minute walk from my NW Portland apartment. That's What Wild in the City, Exploring The Intertwine is about to me. You wrote: It leaves me wondering, in the end does it inspire people to go outside and look up? To naturescape their yards? To support the next bond measure? I think it must help, it certainly doesn't hurt. I know I began my interest based on the web camera trained on falcons in San Francisco in 2005. Thanks Glen and Mike for your comments. It has been a very interesting experience to write the raptor cam blog--especially for one who is not terribly digitally inclined. I find that it reaches a lot of people who note that they were not previously aware of birds in the city. I think like a lot of things people filter out wildlife in the city---they don't expect to see it and therefore they don't. Raptor Cam seems to be an effective tool to recreate that awareness...to open people's eyes. 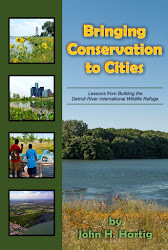 To continue with the questions regarding what we can do toward keeping cities wild...I came across this article from Richard Louv, titled: "New Nature-Smart Careers." In it, Mr. Louv lists 11 categories of prospective jobs that he believes are on the horizon. For example, the job of "Urban Wildscaper" would plan and design biodiverse common areas, including corridors for wildlife. With these kinds of ideas, people like Mr. Louv are able to present us, from a very practical viewpoint, with a different vision, a grand vision, of what the future might look like. it to you to decide’. I am going to send this article to him. Pretty sure he's going to have a great read. I appreciate you for sharing! share through my family and mates. facility for distribution their video tutorials, except I think YouTube is the most excellent. I feel that is among the so much vital info for me. And i am glad studying your article. code and paste that code anyplace you would like. some relax by watching this funny YouTube video, thanks, keep it up. and its assist we can take free from any forum or web site since it takes place here at this web site. comic, I loved it. Thanks designed for sharing this.